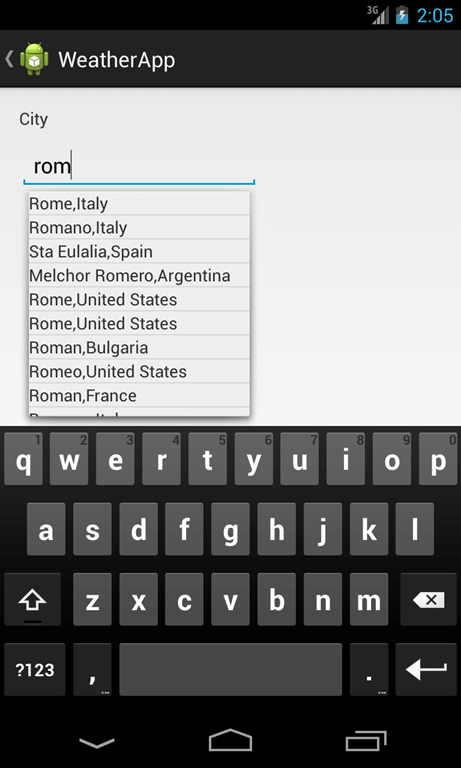 This post is a complete tutorial explaining how to build an Android weather app using Yahoo! weather. The goal is coding a Weather App that will use Yahoo! Weather as data provider. 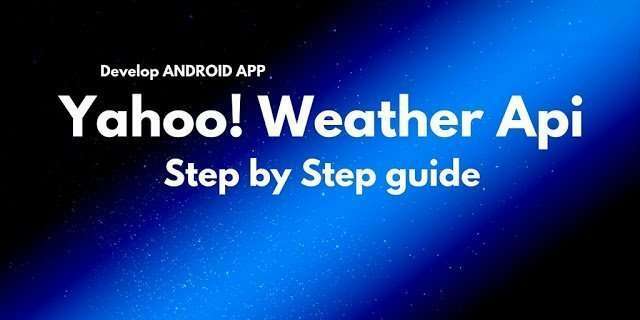 When developing an android weather app, there are some important aspects to consider: the most important thing is how to use Android Yahoo! Weather API to retrieve XML weather data and how to parse XML to extract weather information. Yahoo! 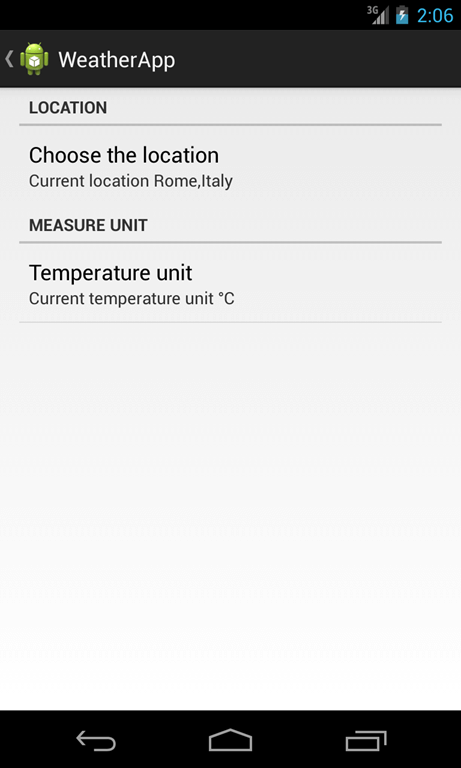 Weather provides free API to use when building your Android weather app. In the last post, we discovered how we can retrieve the woeid from the city name. and is published on the market so that you can download it and play with it. + prefs.getString("cityName", null) + ","
String unit = prefs.getString("swa_temp_unit", null) != null ? "°"
We used at line 1 the SharedPreference class to hold the app settings. Now let us code the android weather activity that enables users to configure the app, we can focus our attention on how to build the client that retrieve the weather information using Yahoo! Weather client. We create a new class called YahooClient where we will implement the logic to connect the remote server and retrieve the data. Finally, at line 18 we add the request to the queue. This layout will be filled, at runtime, with the data extracted from XML. In refreshData method we simply retrieve the app setting stored in SharedPreferences (see line 11,14,15) and at line 18 we invoke the YahooClient method getWeather to retrieve the data. We have to remember that we call the HTTP URL in a background thread to avoid ANR problem, so we wait for the response using a listener (see line 20). When we get the response we update the view. Finally, at line 25, we retrieve the image related to the weather condition. 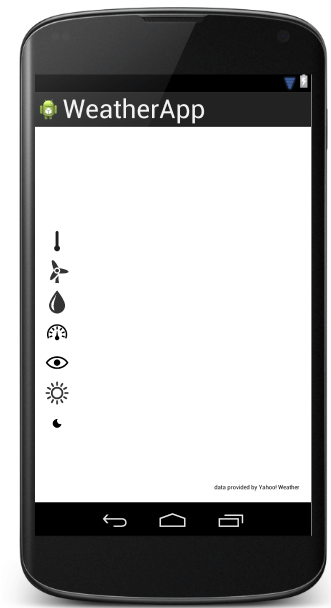 The Android weather app is ready!!! 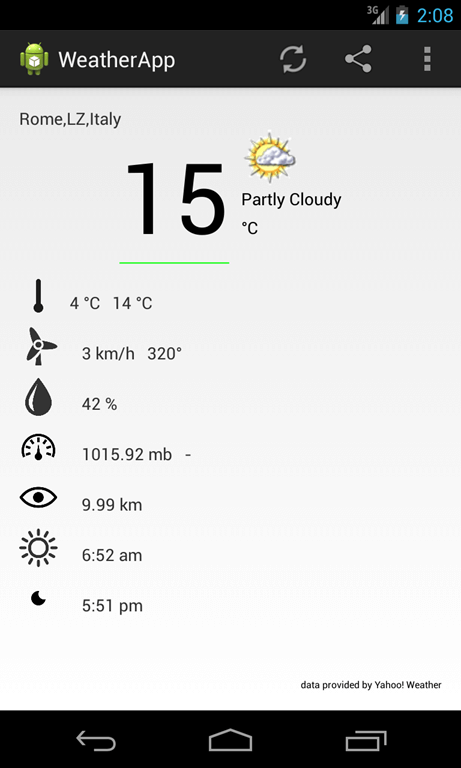 You finally know how to develop an Android weather app to show weather info.